I would say this is one of my better behaved VIB sale hauls. I'm really cutting down on buying one off products that I would only use once or twice and completely forget about. In March I said I was trying to use up more products and that I did indeed! So I needed to pick up replacements and some full size products of samples I had undoubtedly loved. 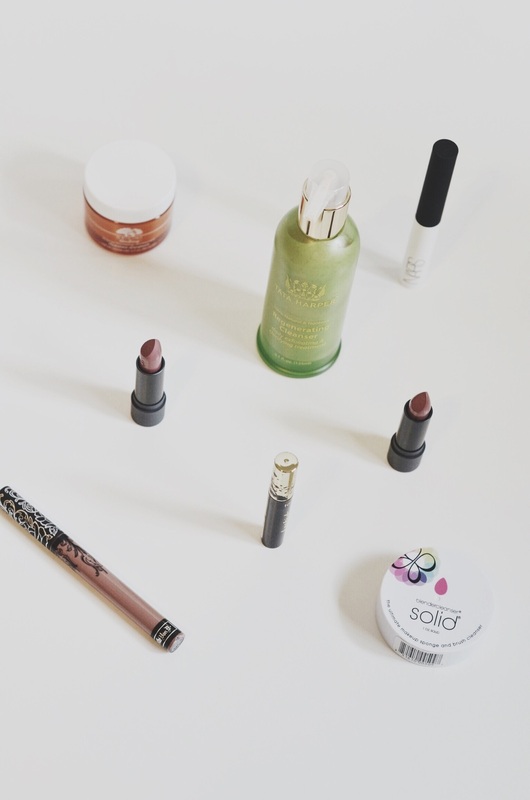 To start off, I went a little lip crazy per usual and picked up three new neutral lipsticks. The first one being Kat Von D's Everlasting Liquid Lipstick in Bow and Arrow. If you follow me on Twitter you may have seen me post of my dilemma between this and the Anastasia liquid lipstick in Pure Hollywood. In the end I went with this one as I knew I loved the formula and the product was cruelty free. (Celina has really influenced me with being more conscientious of cruelty free brands.) *ABH is also cruelty free so that wasn't a big reason on why I didn't choose it! Next up are the new Bite Beauty Amuse Bouche Lipsticks in Chai and Pepper. Celina and Hao have both raved about Chai and its described as a mauve brown so I knew I pretty much had to have it. While swatching like a mad woman in Sephora I fell in love with Pepper (dusty rose) and Maple (brick red) and decided to only go with another neutral. As much as I love my reds I know I don't reach for them as much and shouldn't pick up yet another (For now that is. Fall may be a different story). I had to make 2 repurchases as I was completely out of them. The first being the NARS Eyeshadow Base which has become a firm favorite. It doesn't leave my eyes feeling oily and really prevented cream eye shadows from budging and eyeliner from transferring to my eyelid throughout the day. I also picked up another one of the Beauty Blender Solid as this little guy has made cleaning my brushes an absolute breeze. This really gets deep down and cleans out any bit of product. It'll get your white brushes back to their original white color which makes this costly little bar more than fine by me. New in for skincare is a moisturizer and a face wash. I've been using up a deluxe sample of the Origins GinZing Moisturizer and absolutely loved it. It's lightweight, smells divine, and moisturizes my dehydrated skin without leaving it oily. In sum - this is definitely going to be my go-to for all of Spring and Summer. I'm really going overboard with face washes and cleansers of all sorts and I just can't stop, but this is my last purchase in this category for a while. I've been wanting to try products from Tata Harper and I thought the face wash would be a great place to start as it is something I could use everyday. I went with the Tata Harper Regenerating Cleanser and have been using it for a few days now, both morning and night. The smell is a bit strange as it does smell of Fruity Pebbles at first and then slowly transitions to a cleaning smell. Today is the last day for the VIB sale so I thought I'd post this up today rather than tomorrow (so no post this Thursday). What did you snag up during the sale? Would love to know! Leave links to your sale hauls if you have 'em!